The goal of the NGSIS (Next Generation Student Information Services) Program is to create and deploy technological solutions that help students fully engage in rewarding learning experiences and achieve academic and personal success, and that help faculty and staff to provide a rich and supportive educational environment. 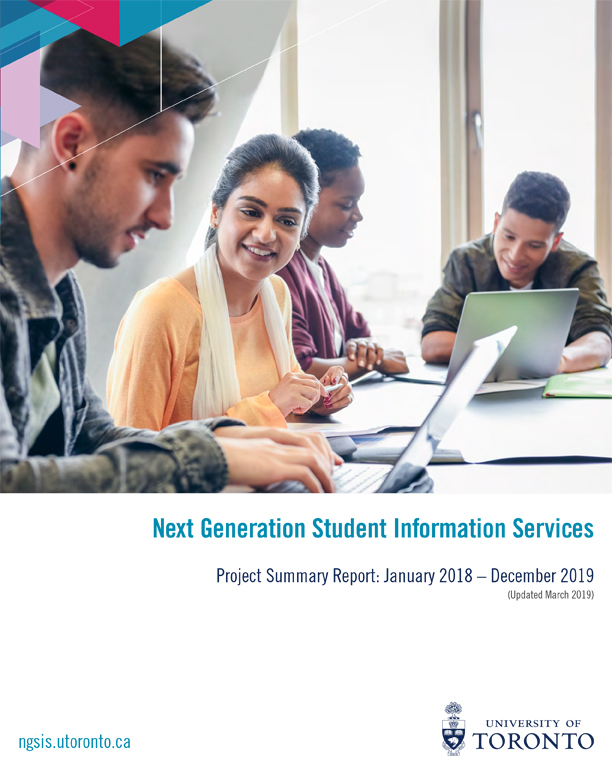 Through a targeted investment in information technology over the past six years, NGSIS has introduced a wide variety of new services for students and staff, providing real-time information about all aspects of the student experience. Broad consultations with users of these services have assisted the technical teams in shaping our products to meet the specific needs of students, staff and faculty. As a result, NGSIS is now actively supporting over 25 individual student and administrative applications in addition to the current ROSI system. Included in this list are some of the most successful NGSIS services for students such as ACORN, Degree Explorer, Transfer Explorer, Convocation e-ticketing, and Course Finder. NGSIS has also released a variety of larger applications for faculty and staff, including Curriculum Management (CM), Course Information System (CIS), ROSI Express, eMarks, StarRez (residence management), applications to streamline curriculum, courses and programs while offering improved processes and reports for student accounts. With a base of successful applications now in place, there continues to be a multitude of opportunities to distribute, integrate, and further leverage solutions and associated underlying information for U of T.
This program is managed under the leadership of Enterprise Applications & Solutions Integration. Download the NGSIS Impact Report and find out more about what we do and the direction we're taking.